We will use your information to respond to you, regarding the reason you contacted us. We will not share your information with any third party outside of our organization, other than as necessary to fulfill your request, e.g., to provide a service quote and/or job. Our website does not ask for nor collect any sensitive information (such as credit card data). The information we do collect via this website, such as your name, phone number, and email address is only used by the owner or employees who need the information to perform a specific job (e.g, billing or customer service). A cookie is a piece of data stored on a site visitor's hard drive to help us track your visit and what website pages you visit. Usage of a cookie is in no way linked to any personally identifiable information on our site. * Automatically log the browser's domain name, and IP address. This information is collected solely for statistical purposes and is not used to identify individuals. * Personally identifiable information such as visitor's name, telephone number, postal address and email address are technically impossible for the traffic counter to collect and no attempt is made to do so. The information that is recorded consists of the date and time of visit, ip address, browser (e.g. Firefox 50.1), operating system version (e.g. Windows 10), screen resolution (e.g. 1200x900), referring link, the current page url and the current page title. 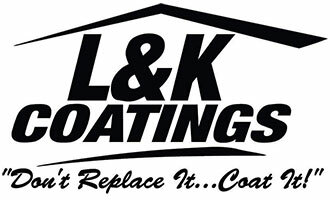 L & K Coatings LLC is not responsible for the use or misuse of any information on this site. Furthermore this site is for information only and should be used only as such. This web site is in no way legally binding L & K Coatings LLC or its users or site visitors to any services, contracts, payments, or transfer of property. Users of this site may gather information from this site to book services from L & K Coatings LLC by other means and not thru this web site.